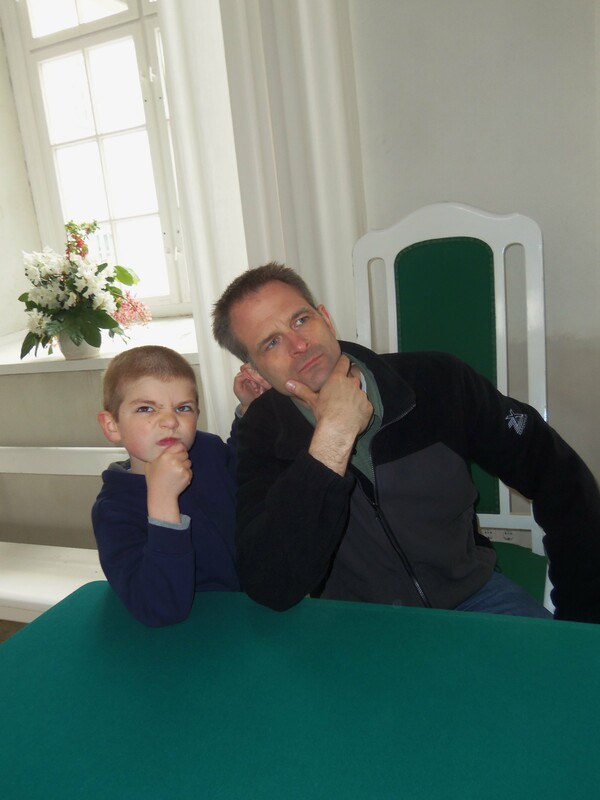 Best of 2012-2013: Another great year! Hi, I’m Nate. This is the end of my second year of living in Prague. It’s been another very fun year of adventures! 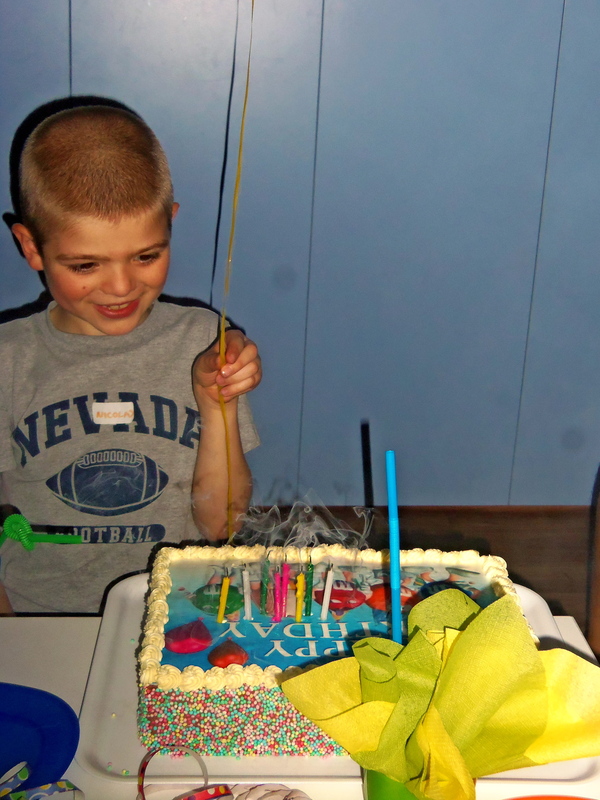 In September I celebrated my birthday with my friends from school. Cake, friends, presents…what can be better? 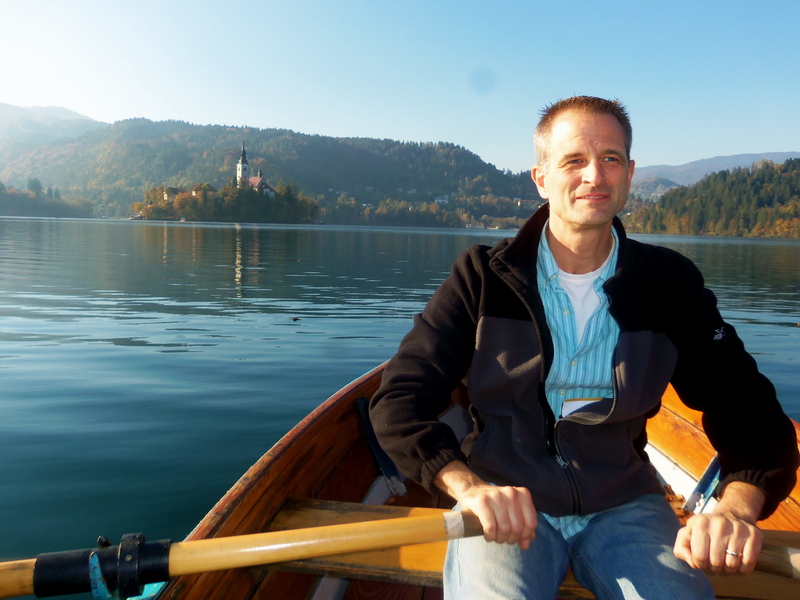 In October we went for a week to Slovenia. That’s part of the old Yugoslavia. It’s next to Austria, Hungary, Croatia, and Italy. 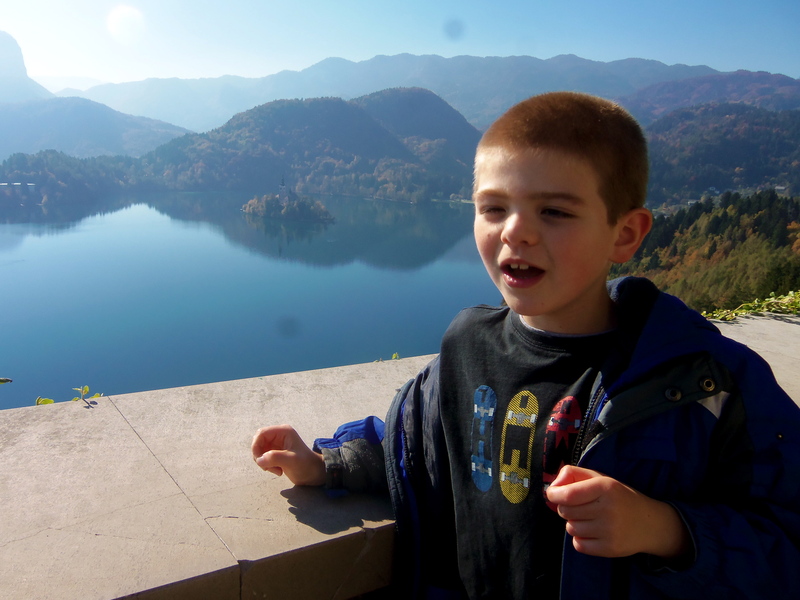 This is the view from the castle on the cliffs above Lake Bled. See the little island near the end of the lake with the church spire? Dad rowed us to the island. 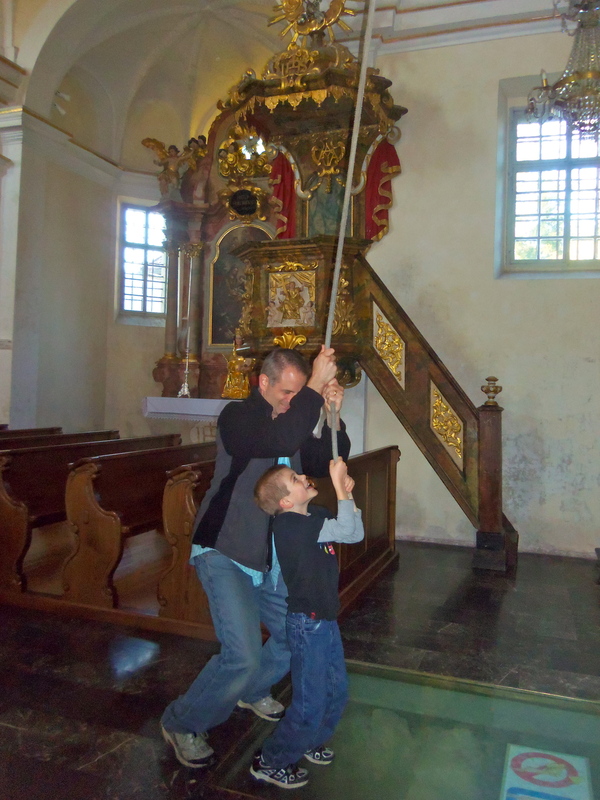 We rang the church bell! 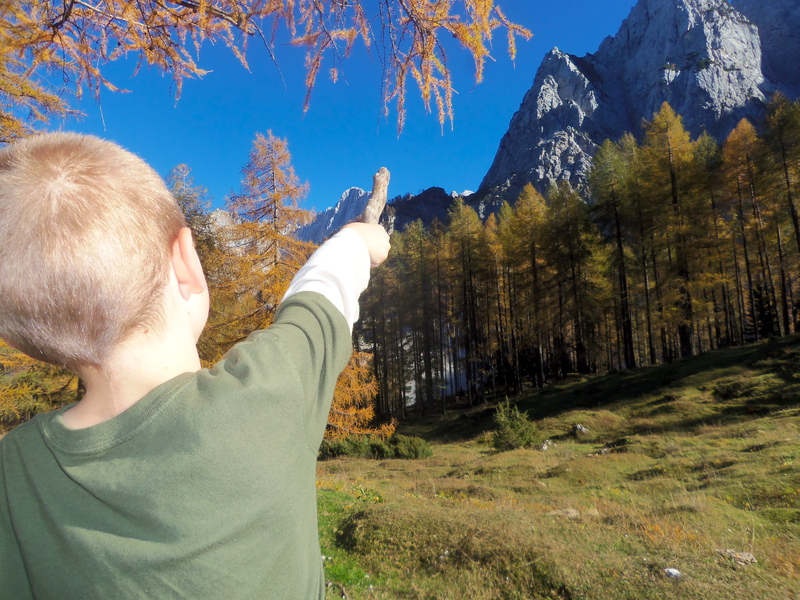 Another day Dad drove us through the Julian Alps. Look at THAT! Pretty cool place for a picnic! Doesn’t it look like a place from Lord of the Rings? 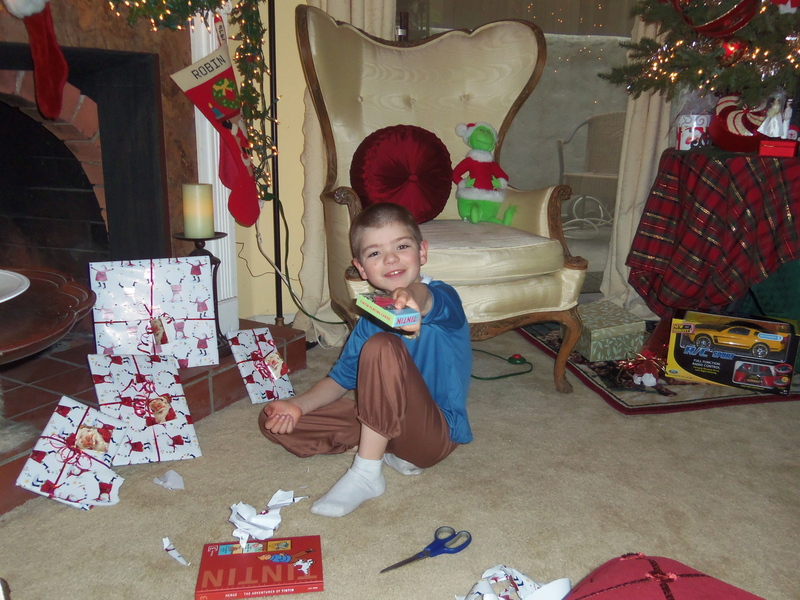 In December we celebrated Christmas TWICE!! Once in California and once in Milwaukee! At my Auntie Robin’s house on a sunny California Christmas morning! 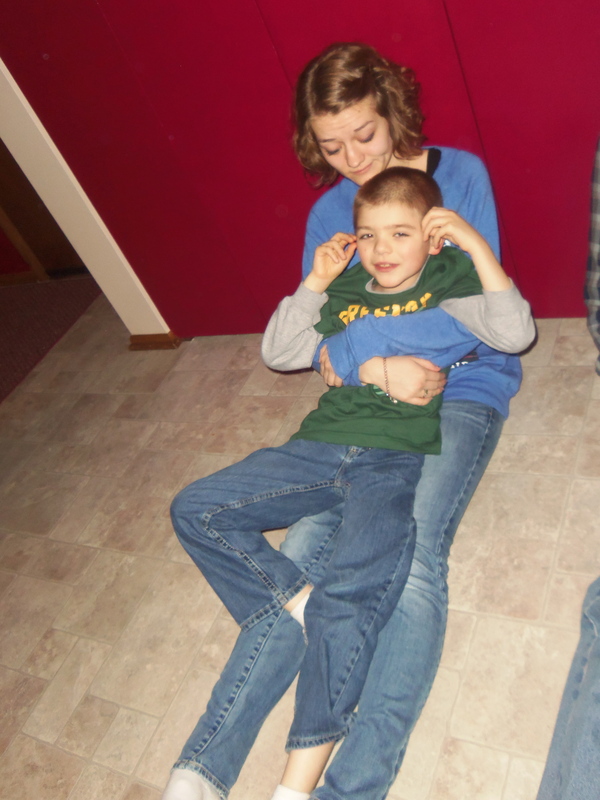 In Milwaukee I got to see my sister, grandparents, uncles, aunts and cousins. I got to meet my new twin cousins! I got to hang out with my big sister, Sam. In February we visited our Turkish friends. We had a blast! We ate tons of great home cooked food. 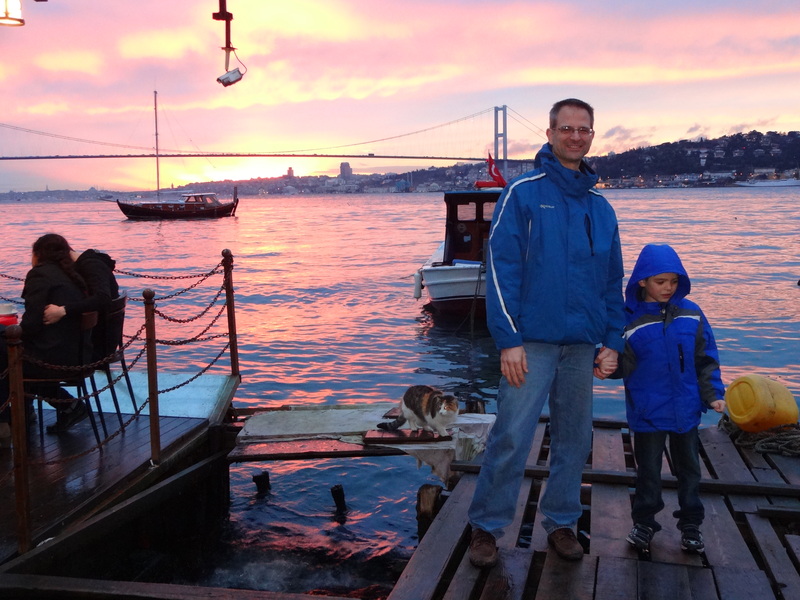 We went to a cafe on the Bosphorus. See the cat behind us? 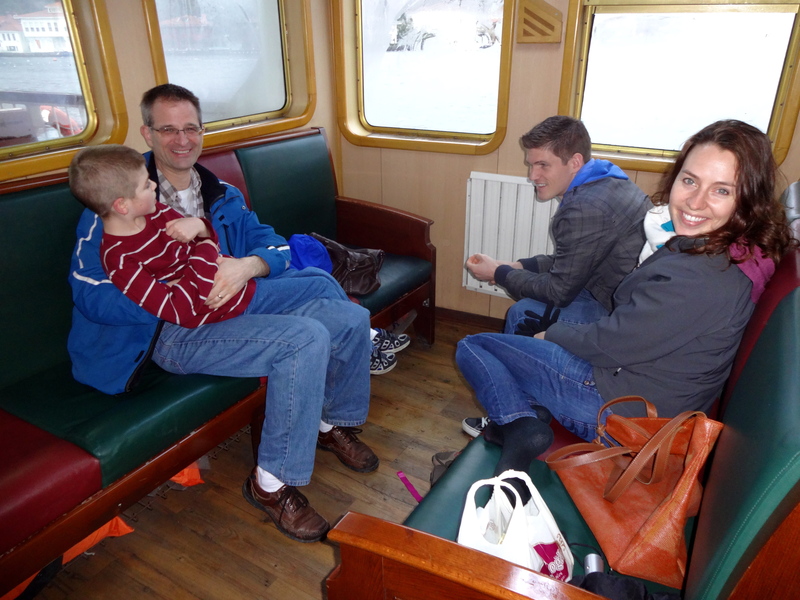 We went on a cruise on the Bosphorus with friends from Prague. It was a VERY rainy day! Later that day we tried dessert with chicken in it!! 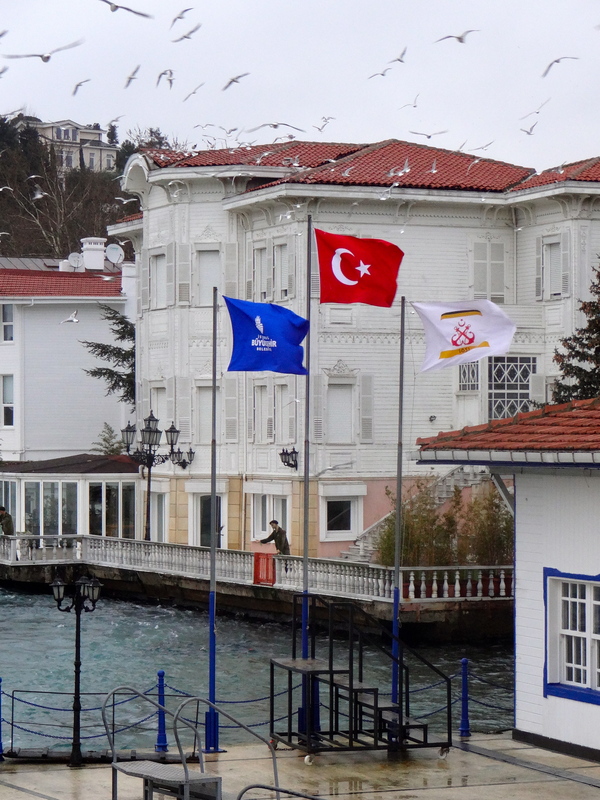 The red one is the Turkish flag. After Istanbul we went to visit our other Turkish friends in Ankara. It was so fun! 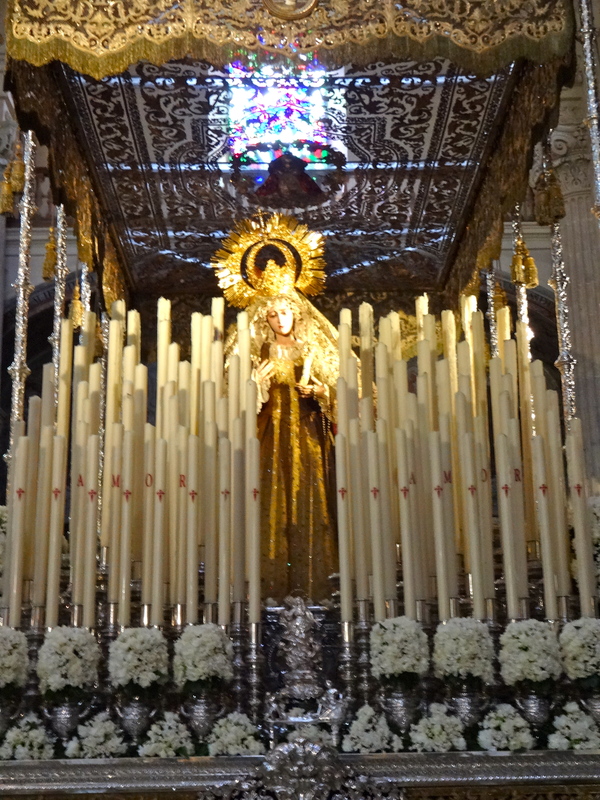 In April we went to Seville, Spain for our Easter Break. 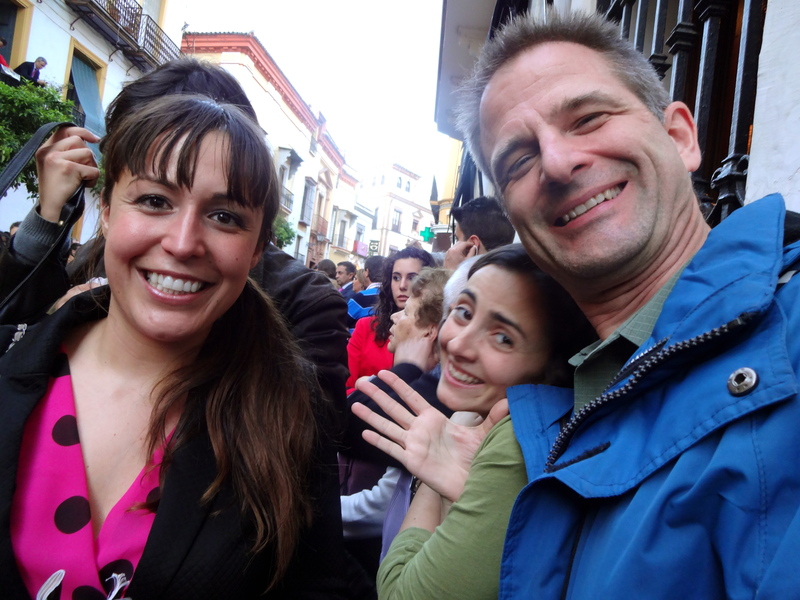 Our friend Ana Maria and her family showed us the Semana Santa (Holy Week) processions. Mom says this tradition is hundreds of years old! This is the procession in front of the float. 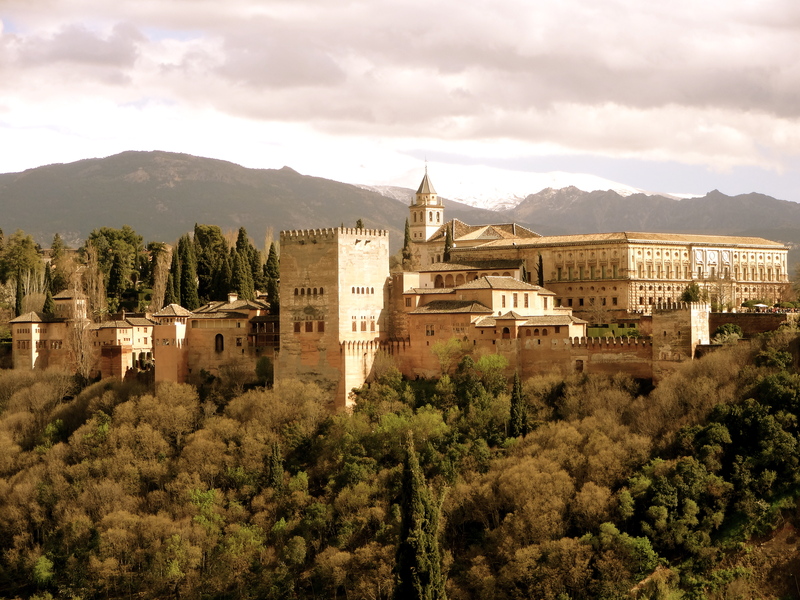 Next, we went to Granada at the end of March into the first week of April. 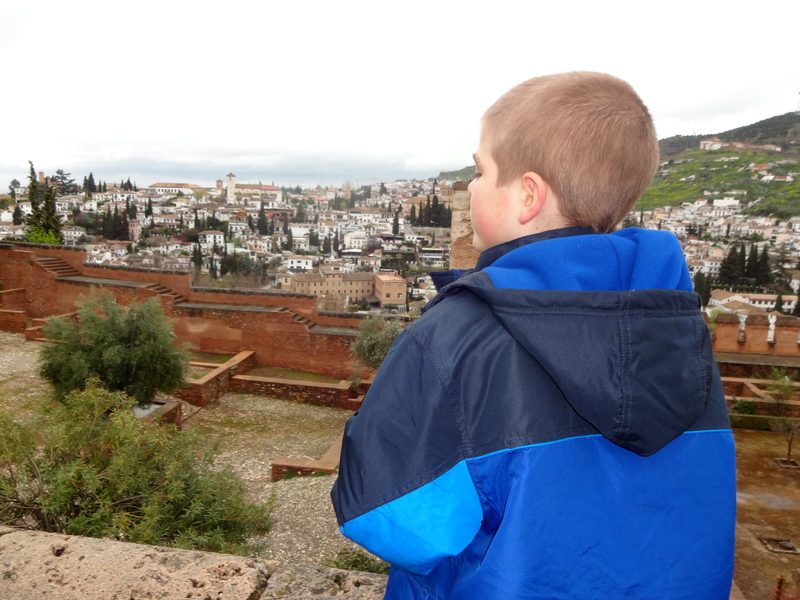 It was fun exploring the Alhambra, but we got drenched at the end! 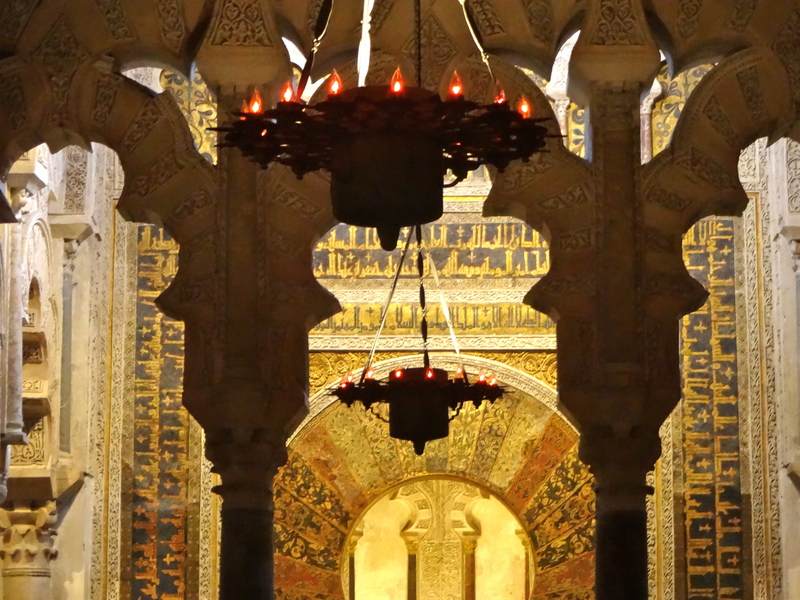 One day we went for a day trip to Cordoba to see the Mezquita. 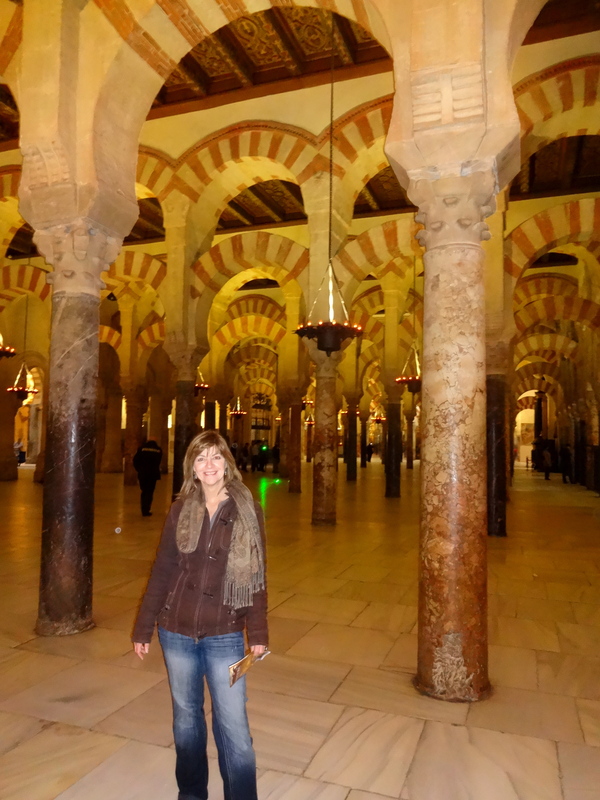 It is a mosque built in the 900’s on the ruins of a Visigothic church from the 600’s. See, it looks like a mosque, right? 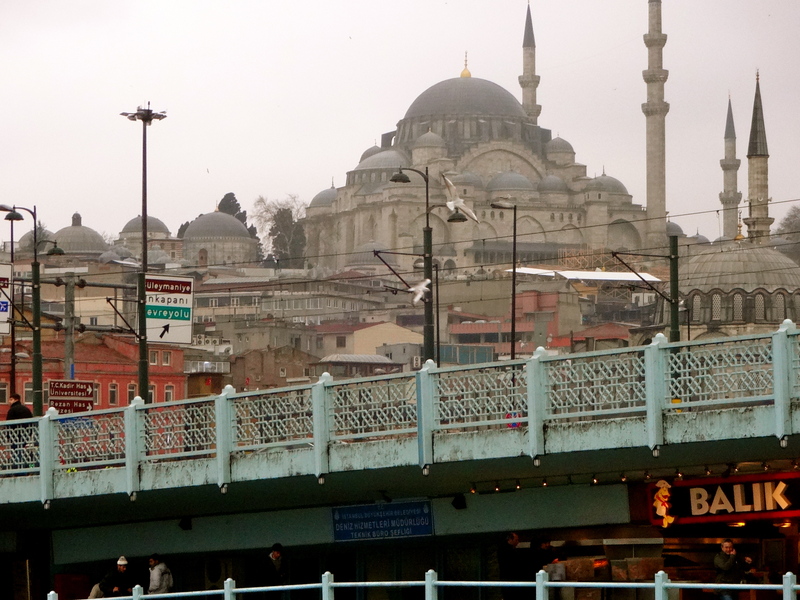 But there’s a big cathedral that pops out of the middle of the mosque! 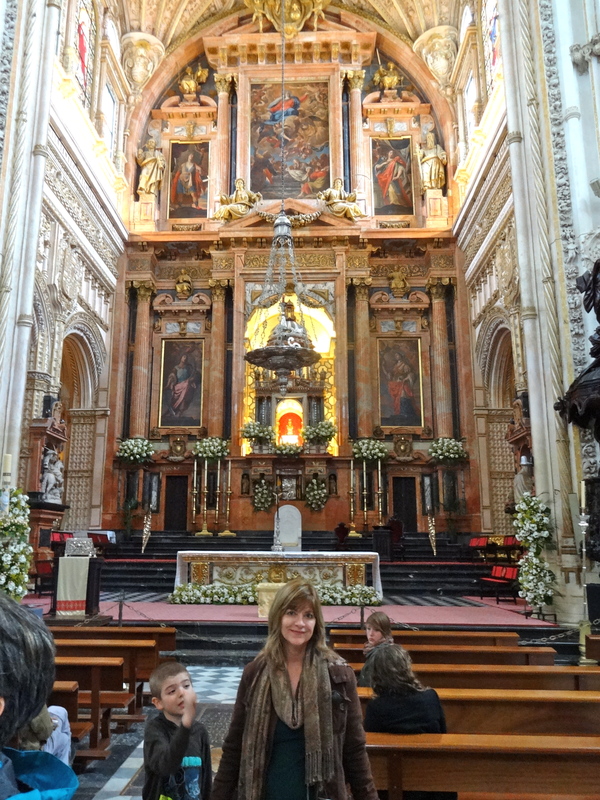 The cathedral was built in the 1200’s after the Spanish kicked out the Moors. 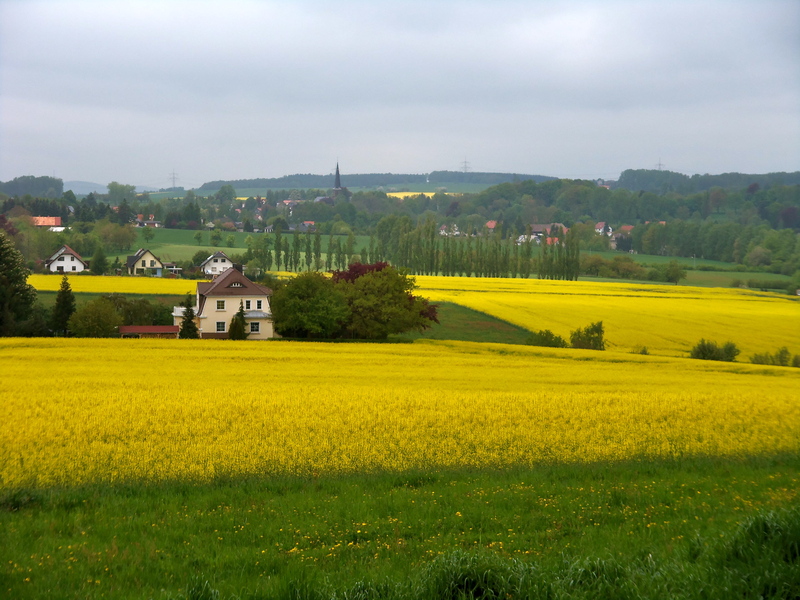 In May we went to Herrnhut, Germany for a weekend retreat with our friends from church. The view from the prayer tower. June was a CRAZY month! Prague got flooded and my school was shut down. I went to school in a hotel for a week! Then we had visitors from India. Next, Sydney and her family come to stay with us and we took them to the Summer Fayre. It was a blast! I got launched in the air! Walking home with Sydney after Summer Fayre. It’s been a really fun school year. I’m excited for summer vacation. 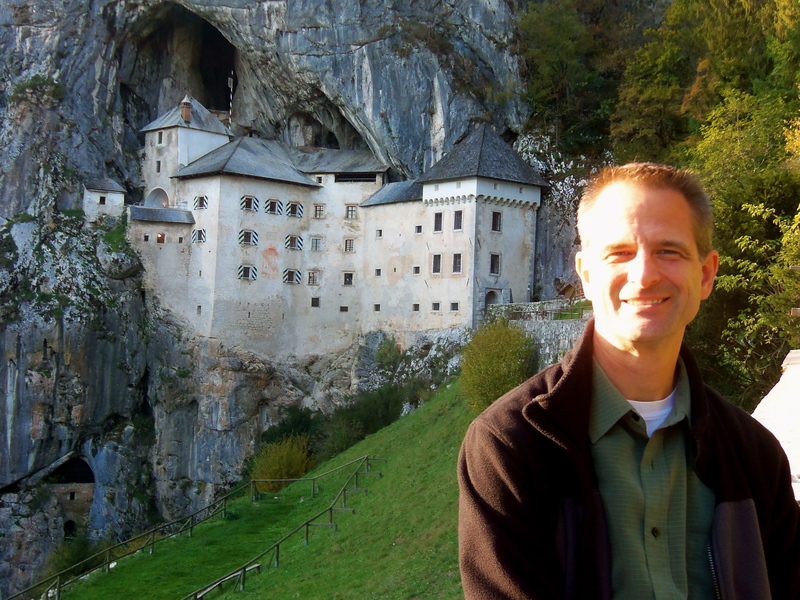 On Monday we leave on a road trip to Germany, Italy and France. Then we’ll come home for five days, and after that we’ll go to Israel. It’s going to be fun! 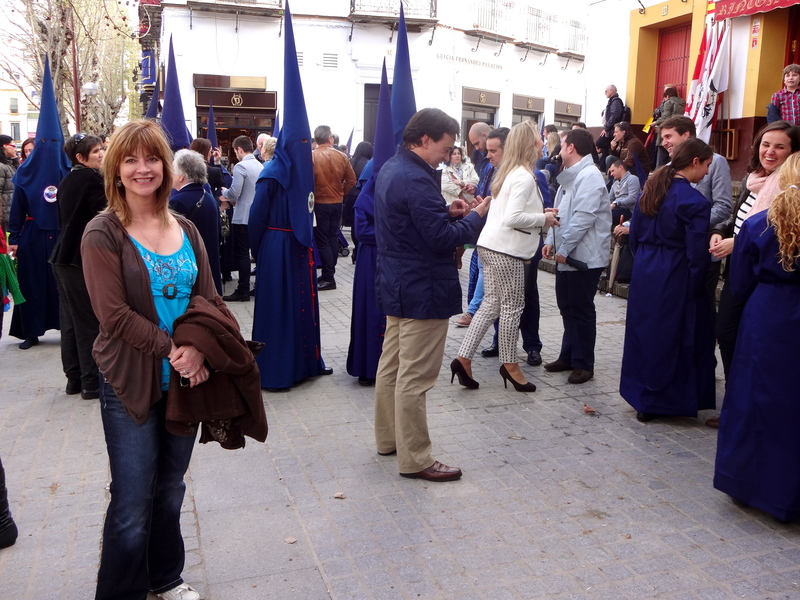 Celebrating Semana Santa in Seville! The best part of traveling is not the sights you see, but the people you meet. 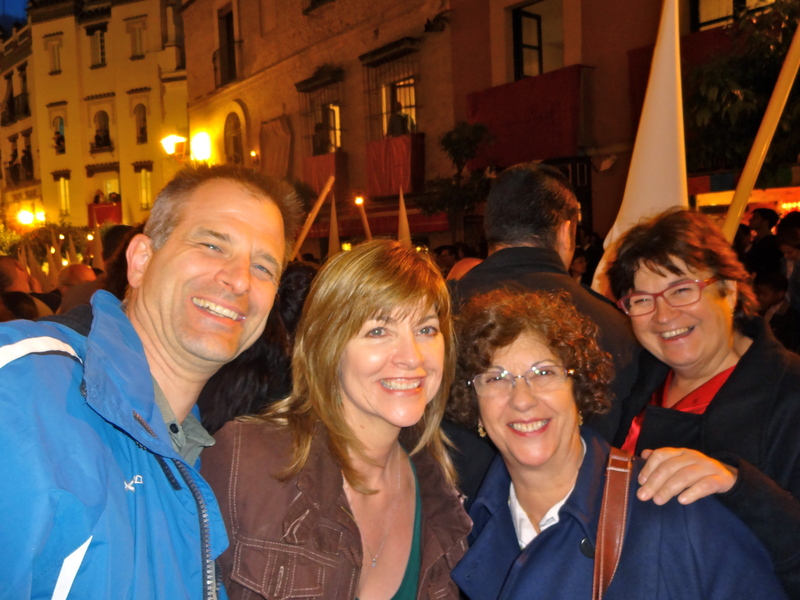 We were blessed to have Sevillan friends who introduced us to their beautiful city and showed us how they celebrate Semana Santa with its traditions that date back to the 16th century. The festivities start on Palm Sunday and conclude on Easter morning. 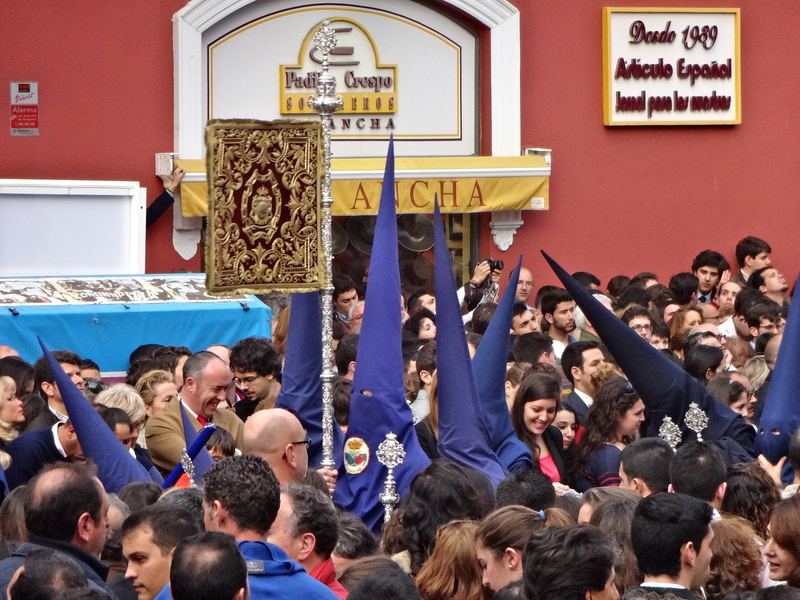 More than 50,000 people wear traditional robes to parade in one of the 50+ processions, which celebrate the passion, death and resurrection of Christ. 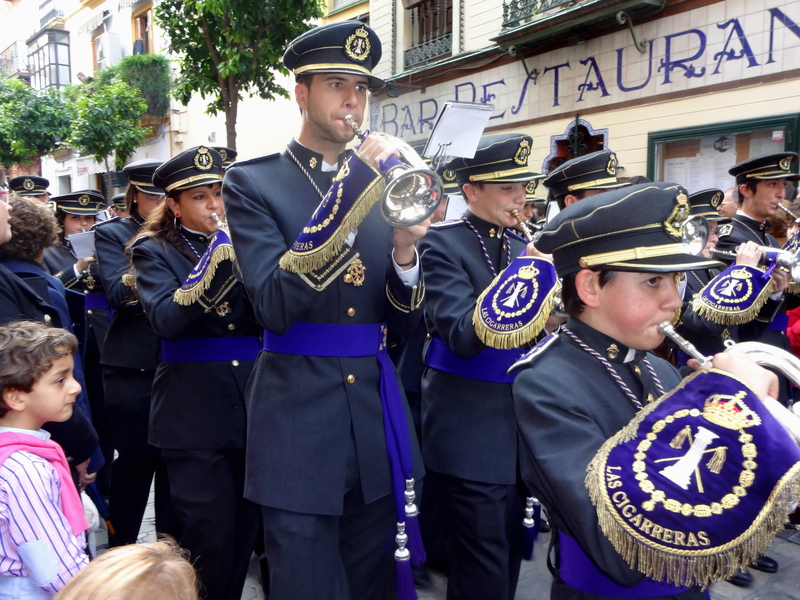 The processions are organized by Catholic brotherhoods (confradias). Each procession has a designated route. 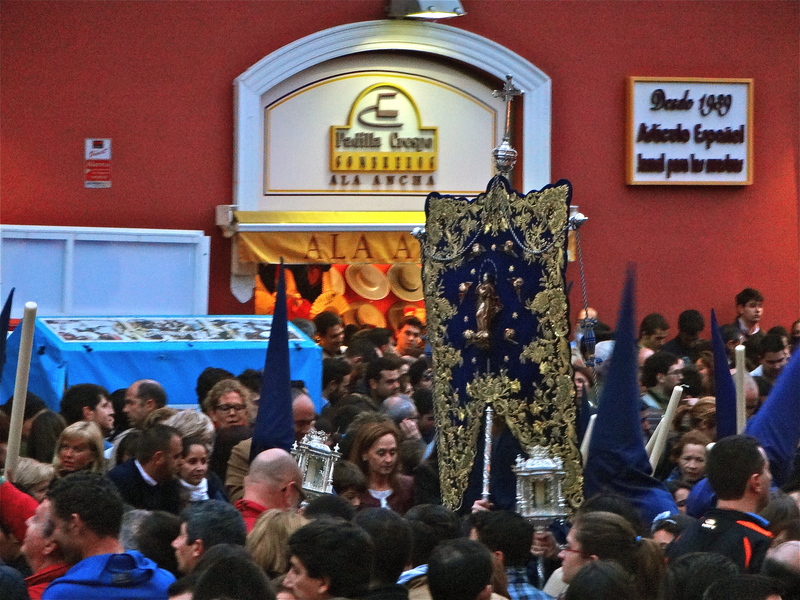 Each procession has two or three pasos (floats), one or two of them representing a scene of the Passion, and the other one an image of the Virgin Mary. 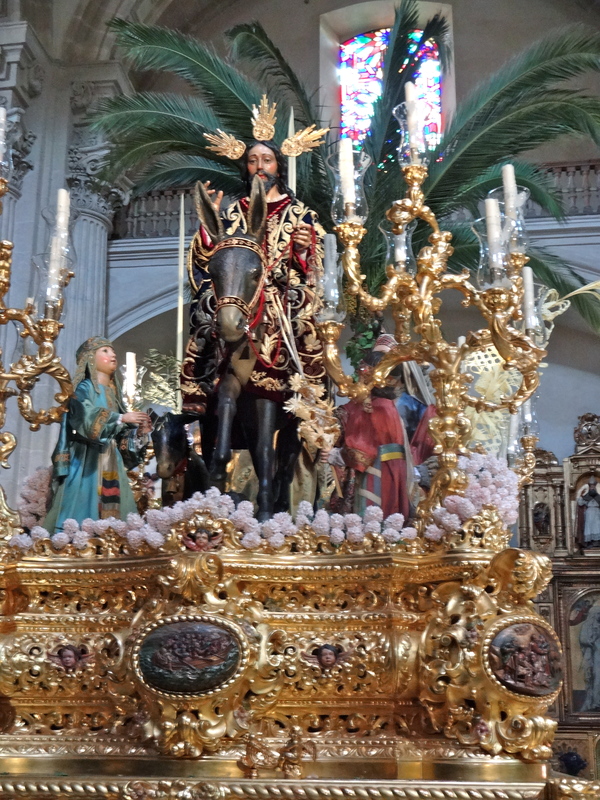 One of our friends took us to Iglesia Colegial San Salvador to see some of the pasos that are part of the processions. The image of Jesus is by Juan Martinez Montanes in 1615. Jesus’ entry into Jerusalem on Palm Sunday. 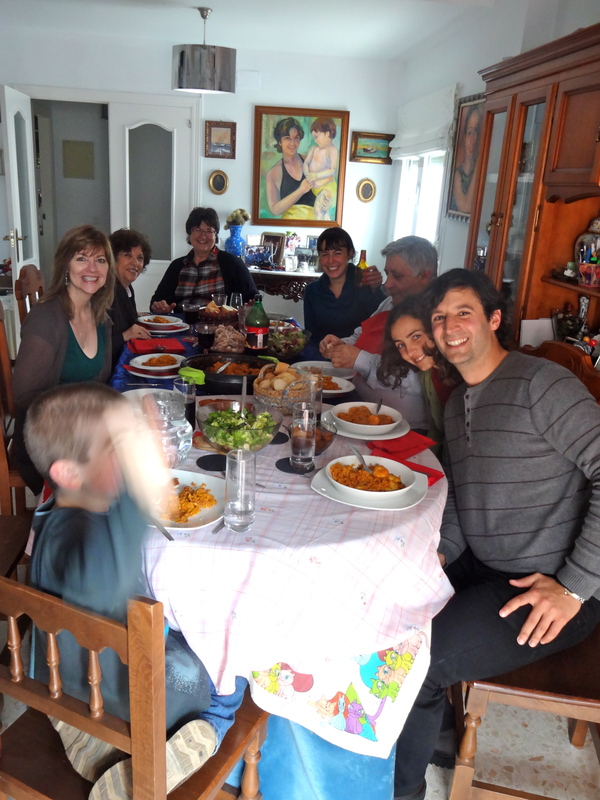 Our friends invited us to a special family lunch on Thursday of Semana Santa. The food was delicious! 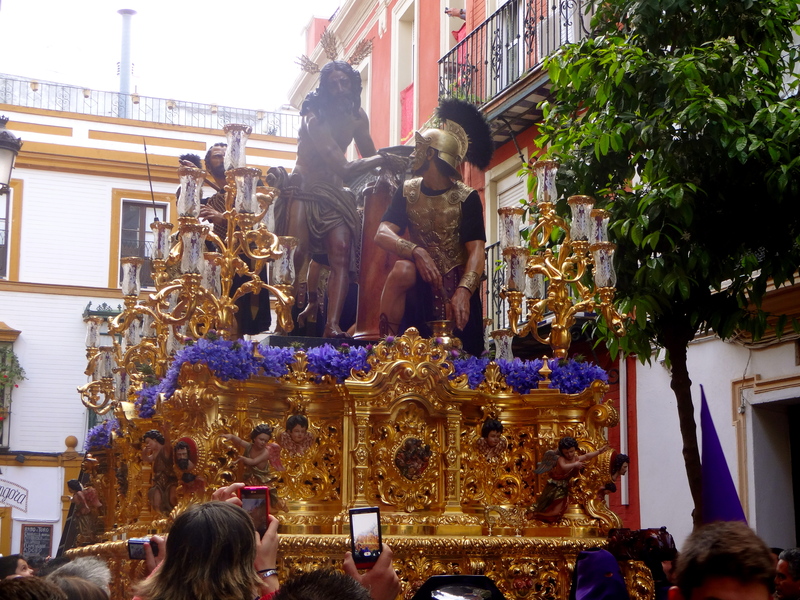 Our friends took us to watch the processions. 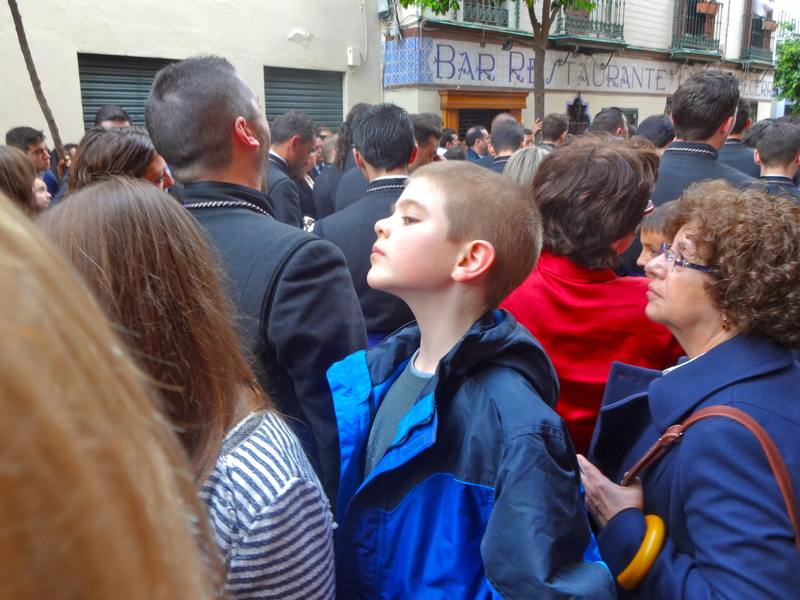 We found lots of people lining the street, hours before the procession was to start. It was a social, family event! Waiting for the procession with our friends! 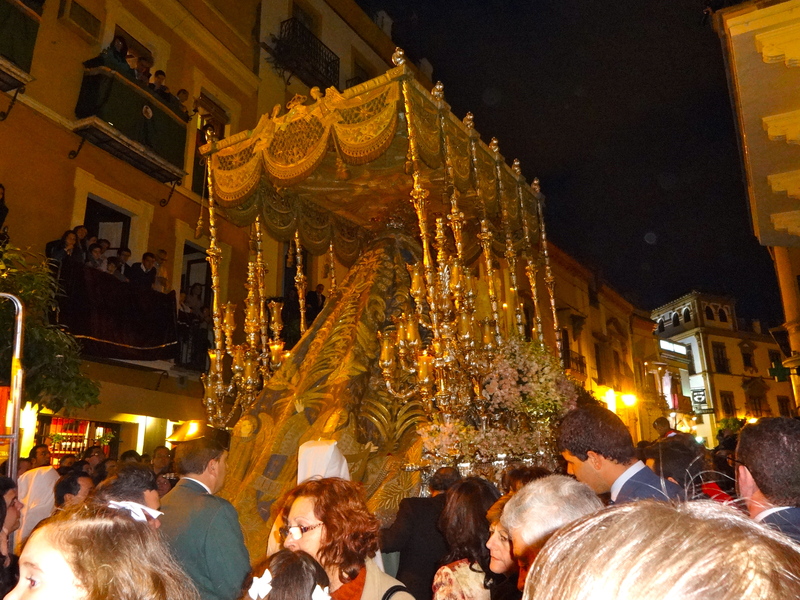 A great cross (called Cruz del Guia) is carried at the beginning of each procession to open the way. A musical band follows or precedes the paso. 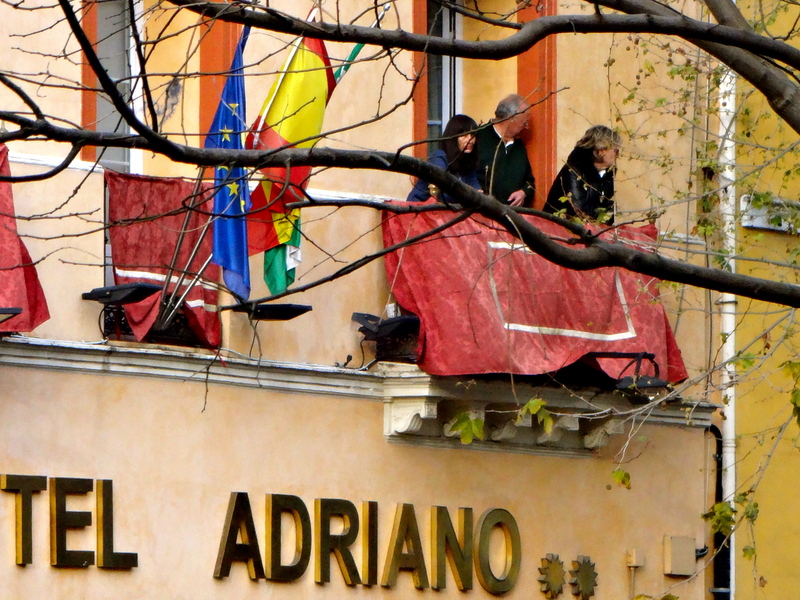 Then come the nazarenos who are members of the brotherhood. 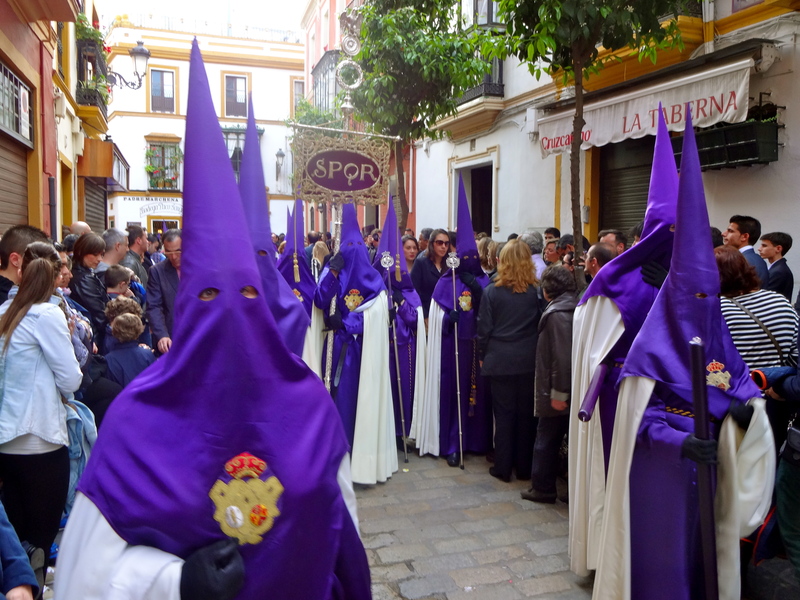 Nazarenos are dressed in a robe, with a tall pointed hat to hide their identity. 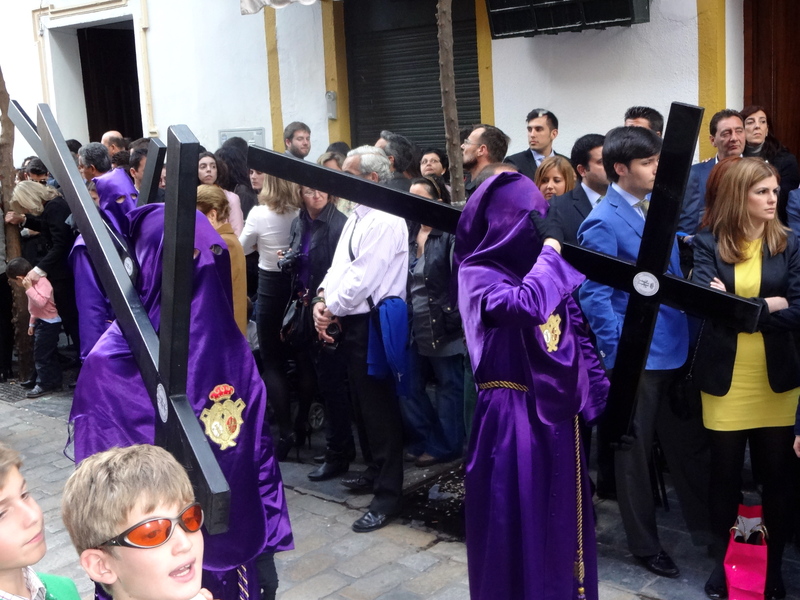 A group of altar boys, dressed like priests and carrying either chandeliers or incense follow the Nazarenos. Next comes the paso. You have to be there to feel the emotion in the crowd. The crowd is reverent, expectant. There is a hush that comes over the crowd as the paso goes by. The paso: “Sagrada Columna y Azotes”. 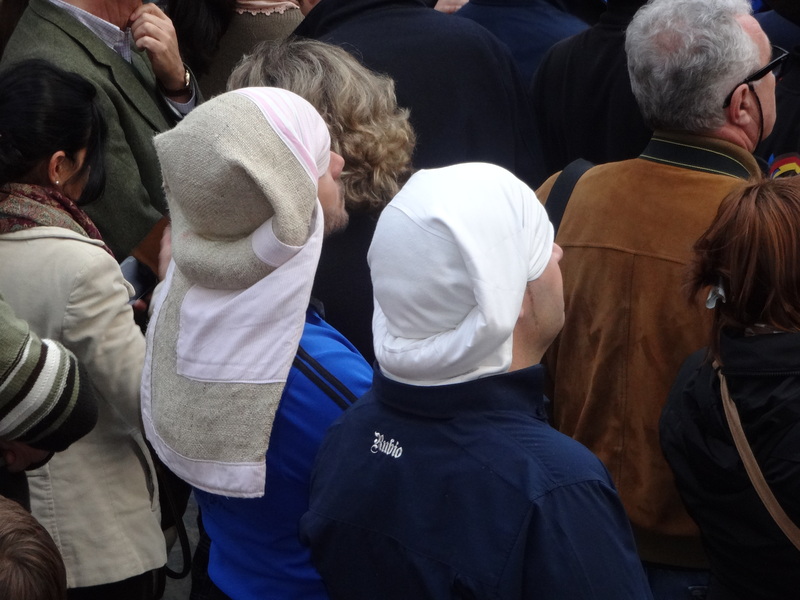 A number of penitents follow the paso. They carry wooden crosses to make public penance. The penitents wear the habit and the hood of the brotherhood, but their hood is not pointed. 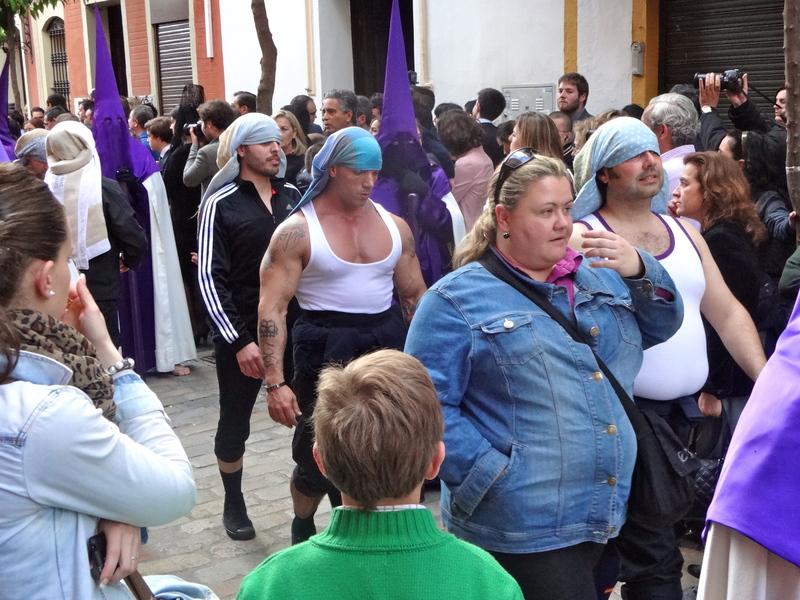 The costaleros are the most important members of the processions.They carry the paso by supporting the beams upon their shoulders and necks. 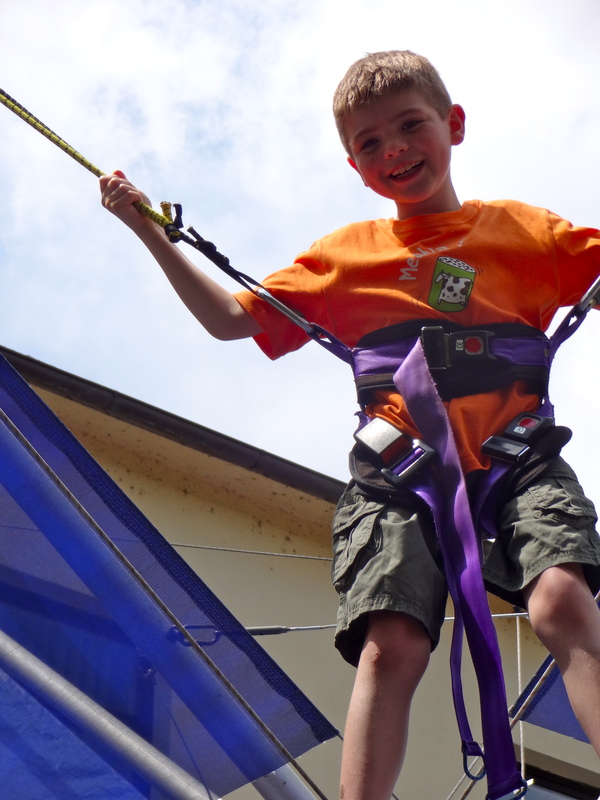 Each one supports a weight of about 100 pounds for up to 8 hours! There are about 40 costaleros per paso. The pasos weigh about 4000 pounds. 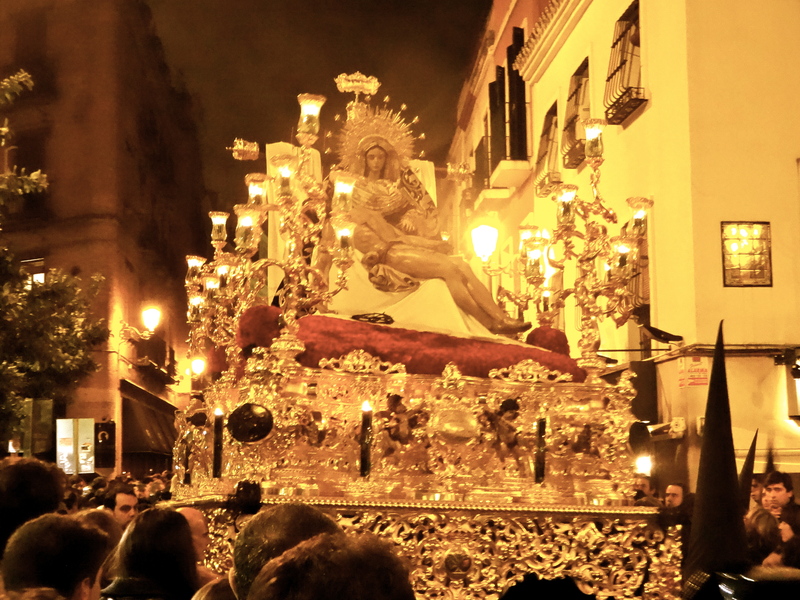 The costaleros also lift, move and lower the paso, unseen beneath the velvet skirts of the paso. The costaleros consider it a great honor to carry the paso. Costaleros watching the procession, taking a much-deserved break. 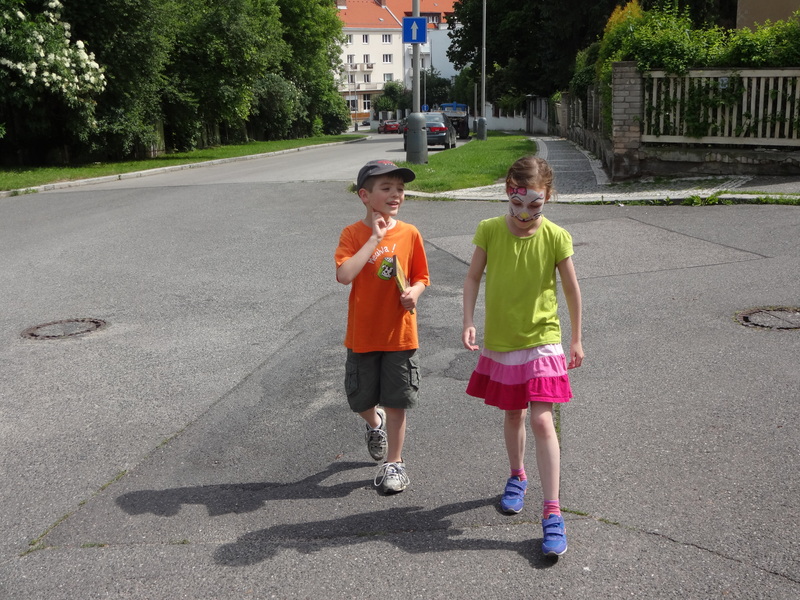 Our friends took us around the city to watch other processions. It was a huge blessing to be with locals who knew where to go and how to squeeze through the crowds to find the right place to wait for the procession! 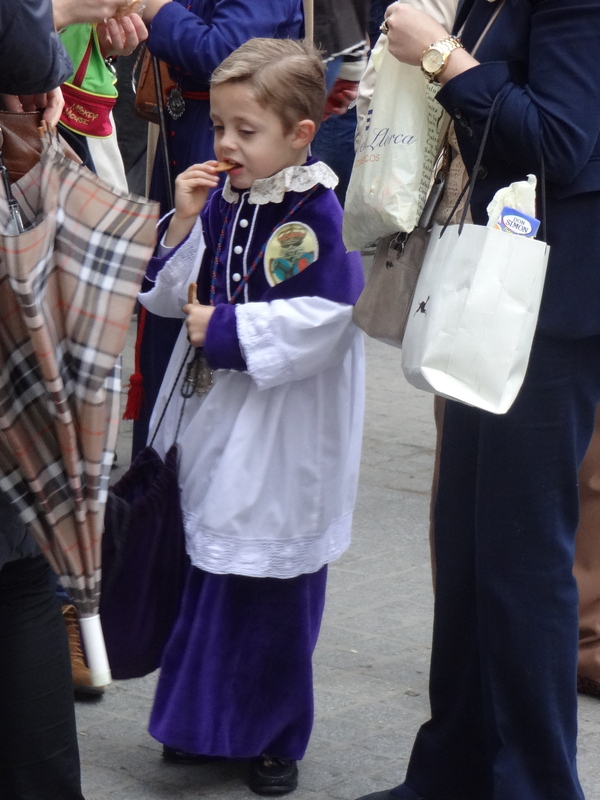 Cute kid watching the processions! 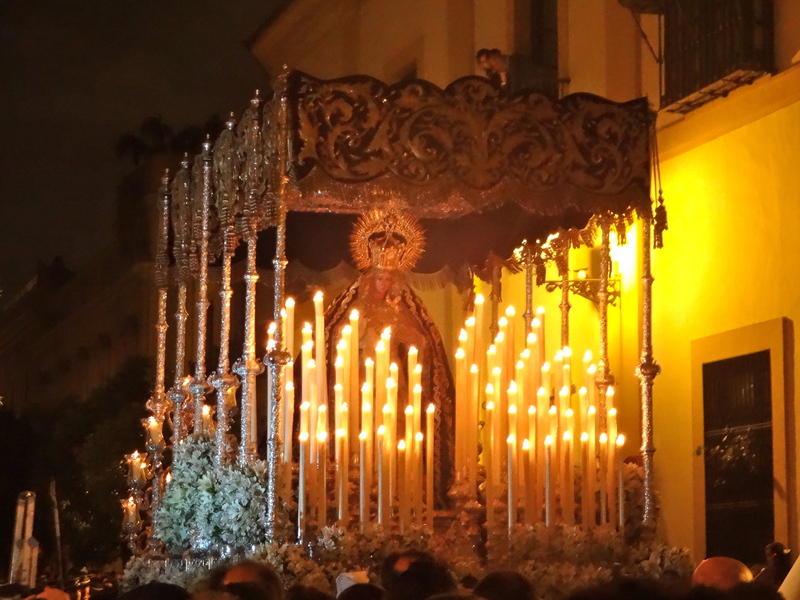 The night time processions were stunning, with the candlelit pasos. The atmosphere was…well, you need to experience it first hand to understand! 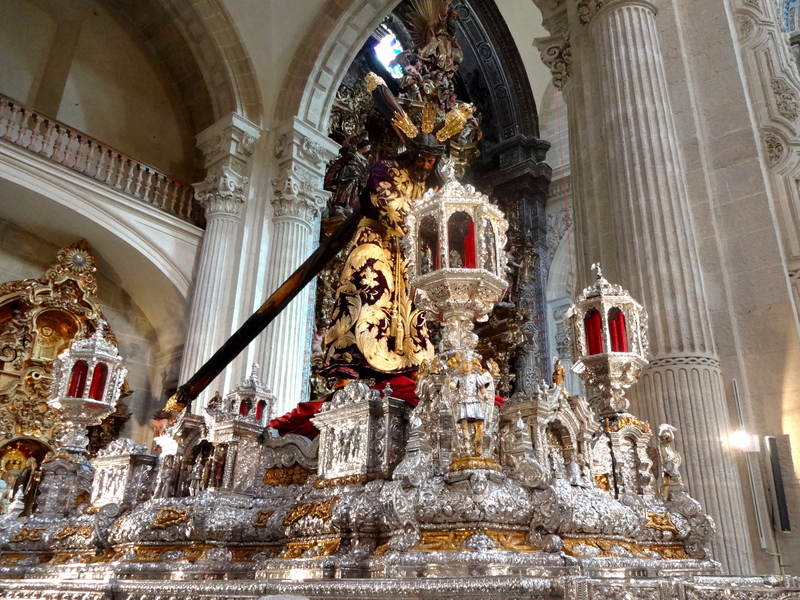 If you would like to learn more about Semana Santa and the Cofradias, try the sites below. They were helpful as I did research for this post. Thanks also to Ana C. for her help! 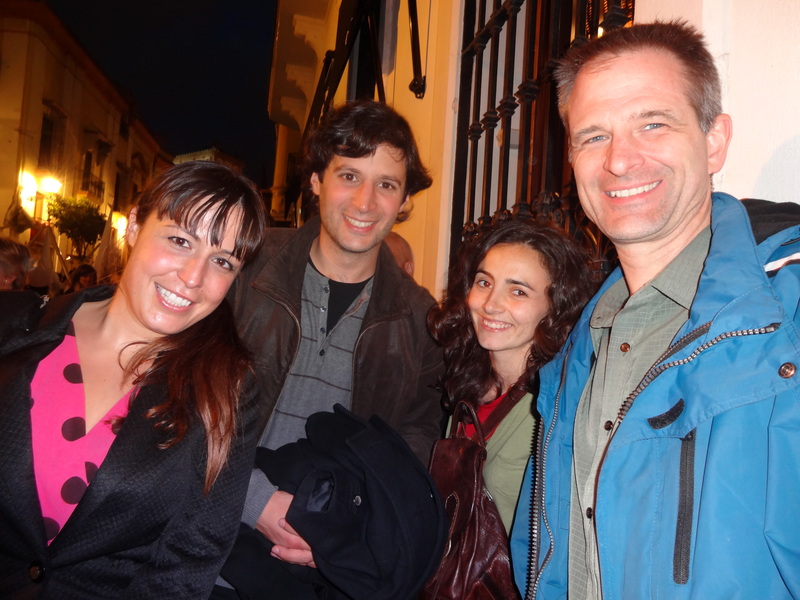 A big thank you to our friends from Sevilla! We will always remember our wonderful week in your beautiful city! !